I may have mentioned it once or twice that I’m getting married soon but I want to take you back to the beginning – to engagement rings! I’ve always felt like the idea of spending an exorbitant amount of money on an engagement ring was kind of silly. I knew I didn’t want something that cost more than my rent on my finger – nor do I need that. You should do what’s financially comfortable for you and your significant other, as well as what fits your personal style. Just because you’re getting married doesn’t mean you have to fit any certain mold. So, I have curated a list of engagement rings spanning the spectrum of financial comfort as well as non-traditional styles. Lastly – my engagement ring set! Whatever engagement ring you or your partner chooses, it should reflect your personal style and you should be comfortable with it. What do you think of these rings? Would you ever choose something like these or do you like the more traditional ring styles? Nothing wrong with that! Let me know in the comments below. Gosh this post gives me so memories of having similar conversations with my (then) boyfriend, (now) husband. He wanted to know what kind of rings I liked and I wanted a unique ring. That was all that mattered. My nightmare would have been to have a plain diamond. It didn’t represent me. Aw yay! I love that story. I felt the same way. I hoped, of course, that he would get the one I wanted but I had no idea. And you know how you can look on Etsy to see if something sold? I would purposefully avoid looking at those after I told him so I wouldn’t get “spoiled” if he did buy it. I think these are all beautiful! My sister would really be into these, they’re so gorgeous and unique! My husband and I got engaged in college, so we kept the engagement ring simple and affordable, too! I never would have thought to check Easy for an engagement ring, but these are gorgeous! These are very pretty and prices are nice. Its insane how expensive some rings are at the jewelry store. Wow these are beautiful! I though the first one was my favorite, but that uncut blue stone is gorgeous too. I can’t believe the prices on these…my husband and I have no rings at all, partially because of cost. 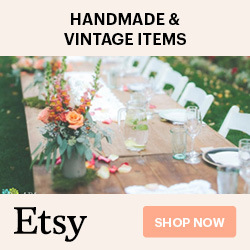 I never considered Etsy! Thanks for the tip. And, CONGRATULATIONS on getting married!! I love how cute these are! I’m a traditional kind of girl and definitely just like solitaires but I did use to work in the jewelry industry and know that women want something unique and it’s also difficult to find at most stores and it usually costs a ton of money! You are paying for that uniqueness! These are great and definitely something I would love too! If I could go back, I’d definitely hint towards that pearl ring, it’s so simple yet beautiful. These are all stunning and so unique! I wouldn’t mind one for my right hand!